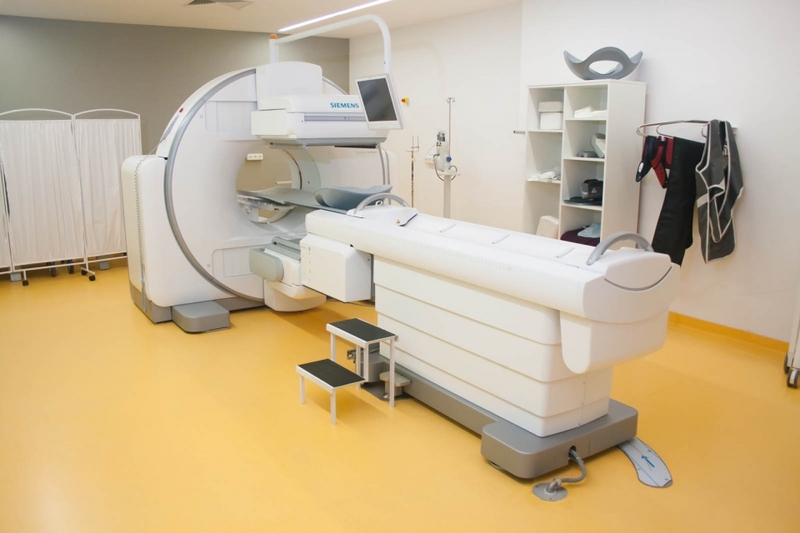 Positron emission tomography, also called a PET examination, is a diagnostic method that includes the creation of physiological images of the human body, based on the detection of radiation from the positron emission. Positrons are small particles emitted from a radioactive substance administered to the patient. The imaging of the human body with this technology is used in diagnostics and evaluating the status and course of many diseases. 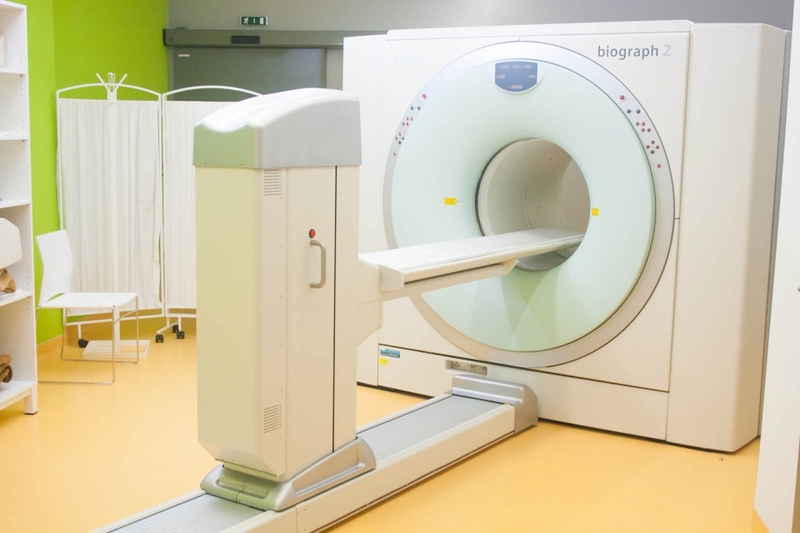 PET (Positron Emission Tomography) and CT (Computer Tomography) are used by physicians to diagnose and determine the course and stage of a disease. By combining these two examinations, where the PET examination describes the body’s biological function before anatomical changes occur and the CT provides information on the body’s anatomical details such as size, shape and position, physicians are able to diagnose and evaluate diseases much more accurately. What is this examination used for? 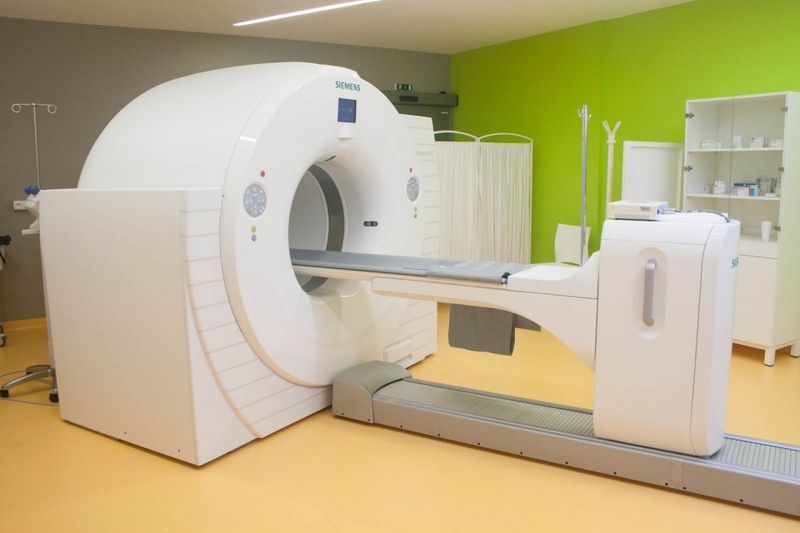 A PET/CT examination is most commonly performed with 18FDG to diagnose cancer and evaluating anti-tumour therapy effectivity through characteristic biochemical changes in the tumour. This method can be used to examine the entire body. A PET/CT heart examination with 18FDG can visualize heart muscle perfusion and thereby help detect symptoms of coronary artery disease. A PET/CT heart examination can also determine whether areas of the heart with a reduced function are vital or scarred as a result of myocardial infarction. In combination with myocardial perfusion examination the PET/CT examination allows the differentiation of a non-functional cardiac muscle from cardiac muscle in which the blow flow can be restored using angioplasty or a coronary arterial bypass, thus improving the heart’s function. PET/CT brain examinations with 18FDG are used to examine patients suffering from the dementias of different aetiologies, a suspected tumour, confirmed brain tumour or seizures (epilepsy) not responsive to therapy and therefore candidates for surgery. PET/CT with 18F-choline is used for diagnosing prostatic carcinoma. PET/CT with Gallium-68 PSMA (Prostate-Specific Membrane Antigen) is an examination for the diagnostics of prostatic carcinoma (staging, re-staging, therapy planning, biopsy planning). This examination is characterized by high specificity and sensitivity. When compared to PET/CT with 18F-choline it has a 10 % higher diagnostic accuracy. Some studies indicate the ability to detect pathological tissue of up to 58 % at PSA levels of 0.2-0.5 ng/ml or 73 % at PSA levels of 0.5-1.0 ng/ml. This examination is necessary prior to the radionuclide therapy of prostate carcinoma metastasis with 177Lu/90Y – PSMA. PET/CT with Gallium-68 DOTA peptides is designed to diagnose neuroendocrine tumours with high somatostatin receptor expression. Compared to former available examinations, this method has much higher sensitivity and specificity (more accurate disease imaging). Since it is a PET/CT examination, it has much better resolution (approx. 2 mm compared to 7.5 mm in scintigraphy). The technical literature states the specificity and sensitivity of this examination as up to 92-98 % or 90-98 %. The examination is necessary prior to the radionuclide therapy of NET and its MTS with 177Lu/90Y – DOTA peptides. How to prepare for an examination? A PET examination is performed at an outpatient department. Your physician will provide you with detailed instructions on how to prepare for the examination. You should dress comfortable and loose clothing. PET/CT with 18FDG - you should not eat at least six hours before the examination (do not eat sweet meals, including sweet drinks and dairy products for at least 24 hours prior to the examination). You should drink plenty of fluids. Avoid any physical exertion at least 24 hours before the examination (sports, hard work). Your physician will inform you about the use of medicines prior to your examination. Note: Patients with diabetes should have compensated diabetes with blood glucose levels below 10 mmol/l. PET/CT with 18F-choline – you need to come to your examination with an empty stomach, but well hydrated. It is recommended to avoid high-choline meals for 2-3 days prior to the examination (in particular eggs, innards and products made thereof, fish and animal food, soy and soy products, certain cereal sprouts, vitamin supplements containing choline…). If you are taking hormonal therapy for prostatic carcinoma, do not take it on the examination day (you can take the medication with you and take it after the examination). PET/CT with 68Ga - PSMA and 68Ga - DOTA - TOC - no specific preparation is required for the examination. The patient comes to the department at a specified time, well hydrated and fasting. 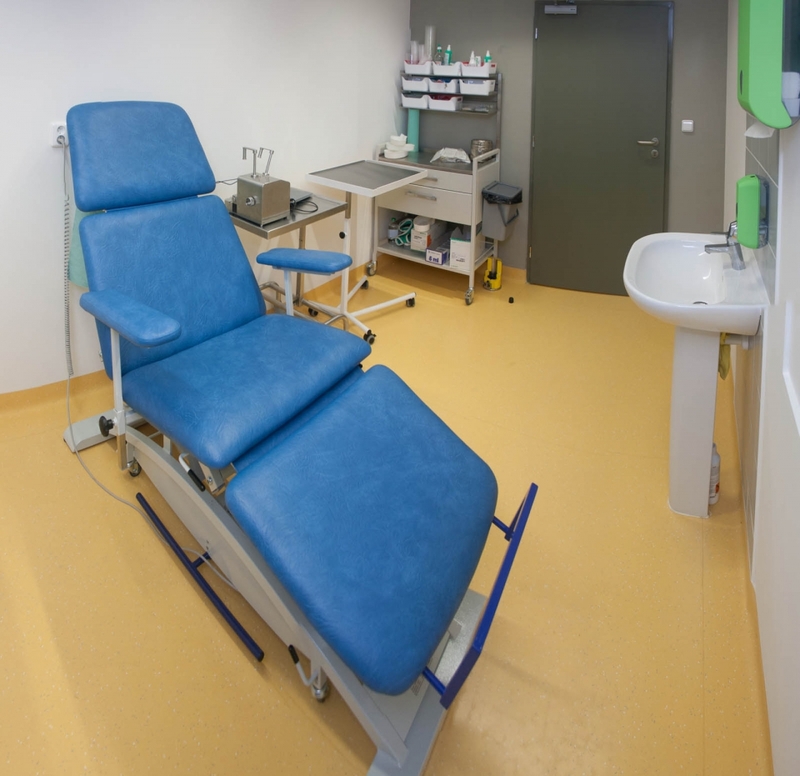 During the examination we will take you to the examination room with a PET camera that has a hole in the centre, into which a table with deck-chair for the patient is inserted during the examination. The device has several circles of detectors recording the emitted energy of the radioactive substance in your body, allowing body imaging. Images of your body are displayed on a computer monitor in the adjoining room similar to a computer monitor you may have at home. Before the examination itself, the radioactive substance is produced in a device called a cyclotron and attached to a “carrier” (“marking it”) natural to the human body, most often deoxyglucose. When this substance is administered to the patient, it is deposited in certain parts of the body and the radioactivity is scanned by a PET camera. The different colours or brightness degrees on PET images represent different levels of tissue or organ function. Since healthy tissue utilizes glucose as an energy source, it collects a part of the “marked” glucose and thus it is also displayed at some intensity in PET images. Tumour tissue, which consumes more glucose than normal tissue, will collect more substance and thus be brighter on PET images than normal tissue. 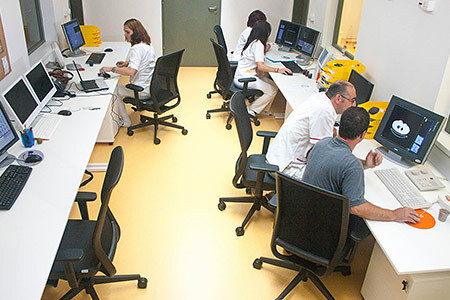 The patient goes through a series of administrative tasks (checking the correctness of data, registering to the hospital information system, informed consent…). The patient has the option of providing his/her own contact details or the contact details of the person authorized to communicate on behalf of the patient. These are the only contact details we will use to communicate with the patient regarding his/her health status. .
Then the patient is taken charge of by a nurse, who administers a cannula to the patient. In a PET/CT with 18FDG, we measure your blood glucose level and administer an anti-allergy drug (Dithiaden) to avoid a possible allergic reaction to the contrast agent taken during the examination. A nurse or radiological laboratory technician will take you to a special application room where you will be given a radioactive substance (mostly administered via a cannula already in place). Then it takes around 60 minutes until the substance penetrates the tissue we want to examine. 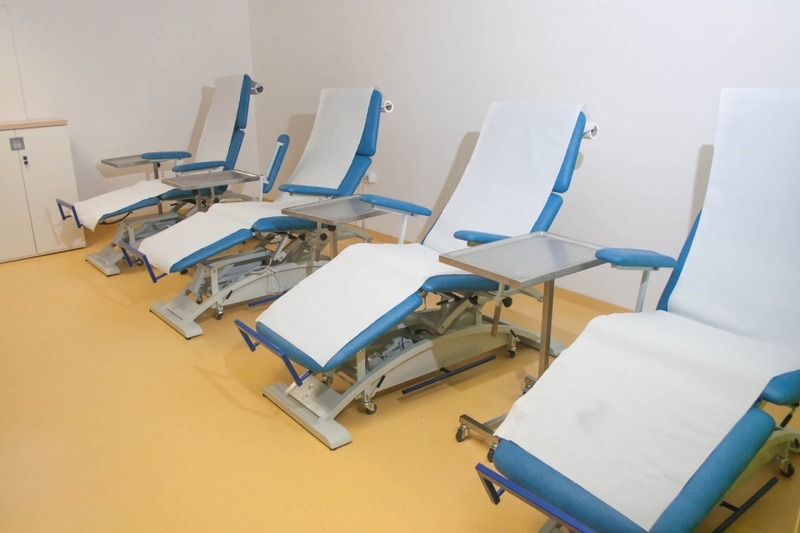 During this time we will ask you to rest and avoid strenuous movements and unnecessary talking, which could influence the deposition of the administered substance. After this time, the examination itself begins. It takes about 20 minutes. In PET/CT with 18F-choline the examination procedure may vary depending on the type and extent of the therapy you have undergone in the treatment of prostatic carcinoma. In general, you need to expect to spend between 1.5 to 2.5 hours, during which you will undergo 1 to 3 scans. The longest one should take about 20 minutes (depending on the patient’s height). Please be patient, we do it for you. In the examination with 68Ga-PSMA, the radiological assistants will take the patient at a determined time and prepare him/her for the start of the examination as well as place him/her on the examination desk of the device. The examination begins with the administration of the 68Ga-PSMA radioactive substance into the prepared cannula. A scanning of the pelvic area follows and takes about 10 minutes. After this scan the patient goes to the waiting room and returns for an examination in about 50 minutes. The subsequent scanning of the torso takes around 15-20 minutes. In the examination with 68Ga-DOTA peptides, the substance is administered to the patient’s cannula at a specified time. 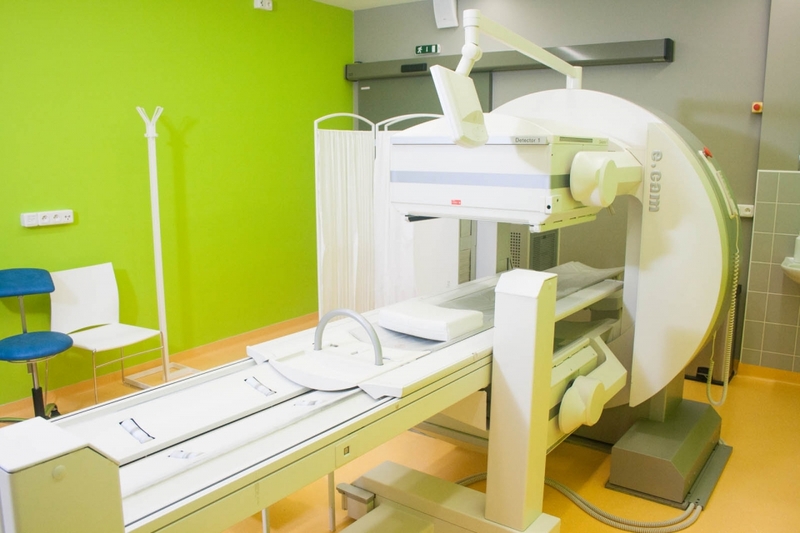 Then it is necessary to wait for around 60 minutes until the radioactive substance spreads throughout the patient’s body, followed by a scanning lasting 15-20 minutes. After the scan the patient goes to the waiting room and awaits further instructions from the staff. During the examination you will be asked to remain completely motionless. Patients with claustrophobia may feel uncomfortable during the examination’s gradual shifting of the desk into the PET camera hole. Some patients may also feel uncomfortable if they cannot move for more than a few minutes. You will not feel anything that could be related to a radioactive substance in your body. Following the examination, a physician will determine whether it is necessary to perform further scans later, which can be after two hours. This scanning usually focuses on a particular area of the body, but in some cases may again include the entire body, lasting again for about 15-20 minutes. Who will evaluate the results and how to get them? 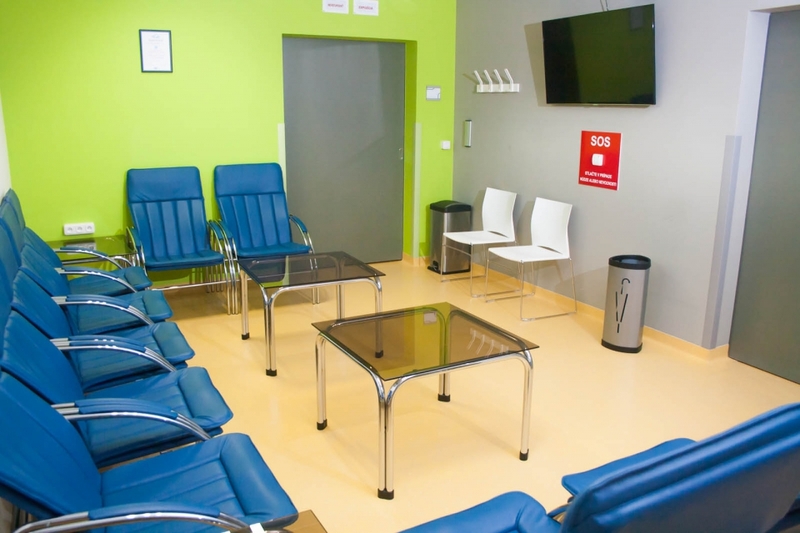 Patients come to an examination because they are sent by their specialist physician. Physicians working on the Nuclear Medicine Department will describe the examination result. The description takes about 2 hours. We try to describe the examination as soon as possible, which means until the following day at the latest. However, in some specific cases it may take longer. The examination result is then sent to the ordering physician by mail and in case of electronic communication also by e-mail. 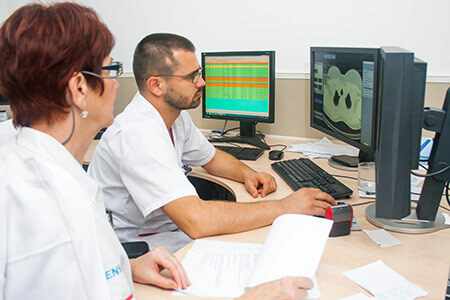 In order to improve the evaluation of the examination, we ask you to bring any results from radiological examinations such as a CT or MRI on an electronic data carrier (CD, USB, DVD) with you. What are the benefits and risks of the examination? 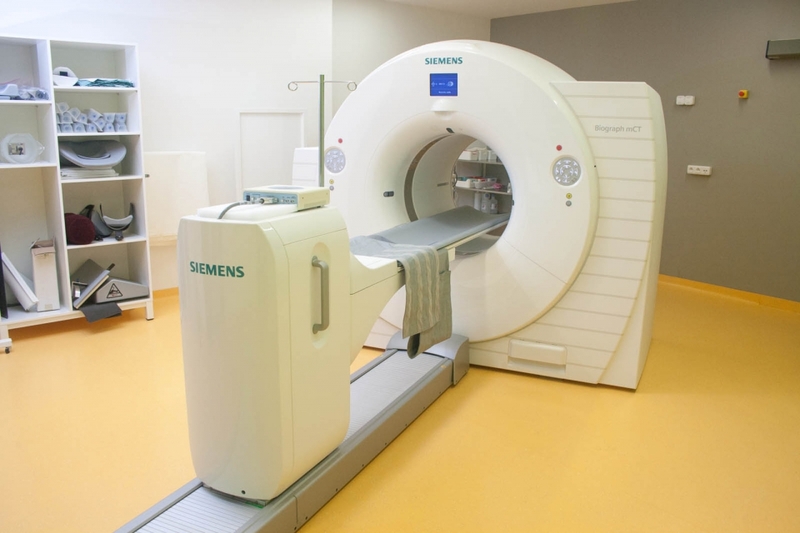 Since the PET examination allows the monitoring of body function, it may help physicians to detect deviations in biochemical processes that may indicate a disease even before the occurrence of anatomical changes, which can be detected with other examinations, such as a CT or MRI. Considering the radioactivity is very short-lasting, your exposure to radioactivity is relatively low. The amount of substance is so small that it does not affect normal processes in the body. The radioactive substance may expose a foetus in a pregnant patient or the infant of breastfeeding mothers to radiation. The risk tolerability for a foetus or infant should be strictly evaluated in relation to the information the PET examination can provide to such patients. If you are pregnant, you should inform the personnel of the Nuclear Medicine Department about your health status before conducting the examination itself. What are the limits of Positron Emission Tomography? PET examination can give us false results, if the chemical and metabolic balance of the patient is not normal. In particular, a PET/CT with 18 FDG results in diabetic patients or patients who eat a few hours before the examination can be significantly altered due to blood glucose or insulin levels. Since the radioactive substance is rapidly decomposed and effective only for a short time, it is necessary to produce it in laboratories available to the Nuclear Medicine Department. It is important that you come to the examination on time and that the substance be given to you at the exact hour.